Researchers at the MassGeneral Institute for Neurodegenerative Disease (MGH-MIND) and Washington University School of Medicine have recently shifted their focus of Alzheimer’s disease (AD) research from understanding the role that plaques and other neurological changes play in the progression of AD. Now they are looking at the time period and order in which plaques and neurological changes like dementia and senility occur in the progression of AD. AD is a neurodegenerative disorder that is classified based on the formation of neuritic amyloid plaques (clusters of dead or dying neuronal cells), neurofibrillary tangles (abnormally twisted protein fragments), dementia and senility. The loss of neuronal and synaptic function in certain parts of the brain has been associated with dementia and memory loss in AD patients. 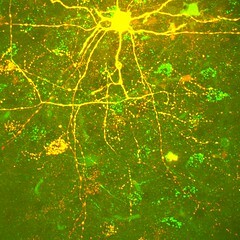 Neuronal and synaptic processes regulate the brain’s electrical and chemical signaling system so damage to neuronal and synaptic connections can cause severe cognitive and speech impairment. AD is progressive and usually starts to present itself between the ages of 40 and 50. The first symptom is typically memory loss; shortly thereafter the individual may develop speech and cognitive problems. Researchers at Washington University and MGH-MIND used a novel microscopic imaging procedure to analyze the time period of neurological changes in transgenic mice they knew would develop amyloid plaques. The research groups began their studies by regularly (weekly and daily) imaging plaque-free regions in the brain of mice. In some cases, plaques appeared 24 hours after an image showing no plaques was obtained. When images from mice were compared to that of individuals with AD, the plaques that developed in the mice were similar to that of plaques that typically develop in AD patients. Further analysis of the mice that developed plaques showed that once the plaques formed, the size did not significantly change. The development of amyloid plaques has for some time now been associated with an increase in the number of microglial cells in the brain of AD patients. Microglia are immune cells that are stimulated by neuronal inflammation or damage. This mouse model included the expression of a fluorescent microglial marker, which showed that microglial cells migrated towards new plaques within 1 day of their development. To date, whether microglia breakdown plaques or prevent further plaque formation is not clear. This study also showed that neurological degeneration caused by plaques hindered normal electrical signaling between adjacent neurons and led to physical AD symptoms approximately five days after the appearance of the plaques. The results of this study showed that the formation of plaques are the initial factor that causes neurological changes like dementia and the loss of cognitive function in AD patients. Groups who study AD at various institutions have begun to analyze the expression of proteins that are directly associated with plaque formation. 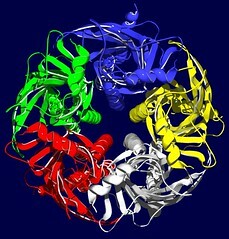 One such protein, called A beta N3(pE), is shorter than the normal A beta protein, has an increased toxicity in comparison to the normal A beta protein, and has an increased aggregation rate. This type of research in combination with recent results that label plaque formation as the primary cause of Alzheimer dementia are currently causing a shift in the focus of AD treatment to the inhibition of plaque formation. This MGH-MIND research project was published in Nature.